3. "WHOIS" handling your DNS? When registering your domain name, pointing it to 3dcart, changing it altogether, or just making basic updates to your domain; you will probably hear the term "DNS" being used over and over again. If you've ever used a hosting service or you've enjoyed an online presence for a while, then you should be very familiar with DNS. However, we understand that many of our merchants are just starting out in the online world and certain terms may be unfamiliar to them. Let's face it, with so many acronyms like FTP, PCI, IP, MX, SMTP, SSL, ISP, URL, etc being thrown at someone just starting out in the eCommerce world; it's easy to see how "DNS" can become just another acronym and easily overlooked. The problem though is that DNS is so important to your online business that a basic understanding of it is really needed to fully grasp how your website works and helps you minimize "surprises" when it comes to setting up or changing aspects of your online presence. This article itends to "de-mistify" DNS and offer a basic explanation of it for our new merchants so they can better understand what their webmasters and support personnel are telling them when it comes to DNS updates and changes. DNS stands for Domain Name System, and it's pretty much the backbone of how your domain name works on the Internet. Absolutely everything related to a domain name (FTP, Email, location, hosting service, etc) is related to DNS. Whether you're pointing something to or from your domain or even just checking your domain's email; if the domain name is part of it in some way, DNS is involved. On the Internet, everything has an IP address. Everything. Even websites. For example, as far as the Internet is concerned, CNN is actually located at 157.166.226.26. Technically speaking, all of the pages, images and information on the site are located at the base IP address. DNS is the system that takes a domain name and points that "easy to remember" name to its base IP address. Without DNS, you'd have to enter "173.194.37.1" into your browser just to "Google" something. The following information will outline the more common ways you (as a domain owner) will need to deal with DNS. When you sign up for a 3dcart account, we'll ask you for your domain name during the sign up process. We'll also ask if the domain name is already registered, or if you would like for us to register it for you (for free). After signing up, we'll create a temporary URL for your site that uses part of your domain - i.e. [something].3dcartstores.com. This is done so we can assign server space and an IP address to your eventual domain name. We also create an entry on our DNS servers for your eventual domain name. When you register a domain name with a registrar service (GoDaddy, Register.com, Network Solutions, etc), the registration service will usually create and point your domain's DNS record to their own service by default. This is usually fine if you plan to also host the domain on their services, but in your case, you'll be hosting the domain on 3dcart. Therefore as part of your welcome email we ask you to update your domain's DNS records to ours. This way, we are able to tell the Internet that [insert your domain] is located at [insert your 3dcart IP address] on our service. If you signed up for 3dcart service and had us register the domain for you as part of the sign up process, this DNS update part is already done for you. Now, it is important to be aware of who is controlling your DNS entries since this will ultimately determine who can make changes to your domain name system. For example, it is fairly common for some domain owners and webmasters to keep the domain's DNS with the registrar and merely point the domain's A Record to their 3dcart IP address. This allows them to self-manage the DNS but it will also negate any control 3dcart will have over making updates to the domain's DNS service. Therefore, please be aware of where your domain's DNS is controlled before requesting domain changes through 3dcart as it might not be under our control. A simple WHOIS (see next section) should tell you where the domain's DNS is currently controlled. This process is a bit more advanced but is definitely possible. As long as the domain name being pointed is the one specified during sign up for your 3dcart service, the A record change should go through just fine. However if you are attempting to use a different domain name than the one you originally signed up for, we would need to make some changes to your account. Please click here for additional information on this. As explained above, there are several possibilities as to who is controlling your domain name's DNS service. 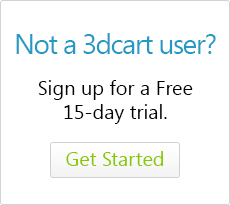 It might be your registrar, it might be your old hosting provider, or it might be 3dcart. It all depends on where your domain's DNS is currently pointed to. The easiest way to determine this is to run a WHOIS on the domain name. The WHOIS command looks up the authoritative record on the domain and returns registration information on the domain as well as its current DNS servers. Enter your domain name in the "Search Domain Ownership Records" field. Click on "Search for Domain"
The WHOIS will return with your domain's current registration information. DNS entries will usually be at the very bottom of the WHOIS listing. Aside from registration and hosting, here are a few other common situations where DNS will come into play. Some merchants will have their domain name's DNS service pointed to 3dcart's DNS for the hosting. However for email, they may want to an external service to host and handle their email. For example, Gmail for Business is available to handle domain email or perhaps you have your own mail exchange service that you'd like to use. To have your email handled outside of 3dcart, we will need to change the domain's "MX Record." An MX Record is yet another acronym to be aware of and it denotes "Mail Exchange" information for your domain. It's the part of the domain's DNS that tells the Internet where mail is sent and handled. If your domain's DNS is handled by 3dcart, simply contact us with the new MX record information (where the mail is being pointed to) and we'll make the changes for you. We'll need to verify you as the account holder for security reasons, but once the MX record change is updated, your @domain email will be handled by the new service. Again, the above only applies if your DNS is with 3dcart. If you or your webmaster are handling your own DNS, then the MX record changes will need to be done with your current DNS entity. In some cases, you may want to add a sub-domain to your main domain name. A sub-domain is something[dot]yourdomain where your main domain acts as the top level, while a prefix acts as its sub. This allows you to keep the same basic presence of the domain, but with different prefixes for different aspects. For example, perhaps you'd like to have shop.yourdomain.com in order to keep your main site and your shopping cart as separate entities. Another example can be for merchants using 3rd party services that require a something[dot]the-domain. Again, whoever handles your domain's DNS (Check WHOIS) will handle the sub-domain change. If it's 3dcart who is handling your DNS, let us know what the sub-domain will be and where it will point. Based on where it's pointing, we will either create an A record on your DNS, or a CNAME. Q: What's the difference between an "A Record" and a "CNAME?" A: It depends where it's pointing to. An A Record points and redirects the entry to an IP address. A CNAME points to another canonical address. For example, if you need to have blog.yourdomain.com to point to 255.255.255.255, we would create an A record. However, if you need blog.yourdomain.com pointed to your-profile.wordpress.com, we would create a CNAME. Propagation is another term that you'll hear often when requesting or handling DNS changes. This is basically the amount of time it will take for DNS Changes to be reflected across all nameservers on the Internet. When a change is made to your domain's DNS - whether it's adding, deleting or modifying entries - the DNS server on which the change is made will update itself with the new information and post it almost immediately. However, other DNS servers online will still need to connect to the DNS server to update their own records accordingly. During this requesting and updating process, there may be some instances where one connection will see the old information, while a different connection will see the updated information. This interim period is called propagation and it's just the amount of time it will take for everyone one to "be on the same page" as it were. Let's say you've moved your domain from your old hosting service to 3dcart. 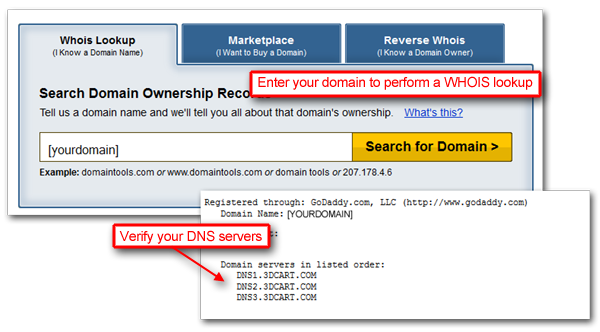 To complete the transfer, you've updated your domain's DNS record to 3dcart's DNS information. At this point, 3dcart's DNS servers tell the Internet "Hey everyone, this domain is now pointing to 3dcart. If you need to know where to view the site, please direct browsers to IP ###.###.###.###"
Scenario: A user on ISP #1 goes to their computer, types in yourdomain.com and attempts to browse onto your site. In the background, their ISP's DNS server looks up the domain name and gets the information from 3dcart's DNS. At this point, ISP #1 updates it's DNS entry for your domain to the new ###.###.###.### IP address. End Result: The person going to your site sees the new information and is taken to the new site. Scenario: A user on ISP #2 goes to their computer, types in yourdomain.com and attempts to browse onto your site. In the background, their ISP's DNS servers looks up the domain name and gets the information from 3dcart's DNS. Unfortunately, ISP #2 doesn't update it's DNS as frequently as ISP #1. Instead it updates the information at a scheduled interval every 2 hours. So while it has the new information, it doesn't actually update it live for ISP #2 users until 2 hours later. Usually propagation can be surprisingly quick considering the amount of DNS systems across the World Wide Web. However in some cases, some DNS servers may take longer to update than others. Therefore when making DNS changes, allow for a propagation time of 12 to 24 hours before seeing the changes online. In some very rare instances you may experience up to 48 hours of propagation, but that is extremely rare nowadays. Hopefully after reading this you have a better understanding of DNS and how it can impact your web site. While it's perfectly fine to control and handle your domain's DNS on your own, we highly recommend having your DNS transferred to 3dcart when you host with us. This way we can make changes for you as needed much quicker and be able to assist you more effectively when the DNS information is controled by us.